The process of manufacturing CD, DVD, and Blu-ray discs in mass quantities is called replication. 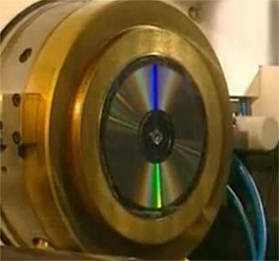 Replication is used for producing large quantities of discs ranging from one thousand to one million copies. These copies are produced from a single original known as a “glass master” disc. The primary concern in quality replication is keeping conditions surrounding the production of the glass master immaculate and sterile through the use of a clean-room. If any particles or pollutants are in the air, it compromises the quality and integrity of every replicated disc. The glass master is a substrate that is made larger than a CD, DVD, or Blu-ray with an approximate 24cm diameter and 6mm thickness. During the replication process, the substrate acts as a medium to carry the layers of metal and bonding agents that make the creation of data and copies possible. Once prepped with a cleaning solution and solvent, the glass master is bathed in a UV-sensitive, photo resist coating. It is then baked for a brief period of time. The photo resist layer allows the glass master to carry the source data by a laser. The Laser Beam Recorder (LBR) is intrinsic equipment to the replication process that’s controlled by a formatter which translates source data to be used by the LBR. Using high powered gas, the blue, violet, or UV beam (depending on what kind of disc is being created) etches the data pits into the photo resist layer. The photo resistor is developed through a chemical process on the glass master. Once development is completed, the master with the data pits is layered with a nickel or metal alloy. The next step is to electroform the glass master. Electroforming is responsible for setting the multiple copies of discs into motion; these replicas are referred to as “fathers,” “mothers,” “sons” (“stampers”). It’s quite a family affair but don’t worry about getting confused. It follows a logical sense of order. Electroforming uses a nickel bath to layer metal on the master’s pitted data surface. The master remains in the solution until enough metal has accumulated on the surface that it can be peeled off in one piece from the substrate. The result is a negative master, or father. Electroforming is repeated, this time with the father in a nickel solution. The pitted metal layer now has a positive data impression, producing the mother, which is also plated with metal through electroforming. With the mother electroplated into one or two dozen metal impressions, sons are created. Sons share the exact negative impression of the father. Now the father becomes a stamper mold along with the sons. The mother is the only metal impression needed to create more stampers (sons). The electroforming of the mother is carried out to the desired disc volume. The stampers are checked, shaped, and center hole punched to the adherence of disc standards. Next, they are injected with liquid polycarbonate and cooled. An automated robotic arm with vacuum-like grip technology picks up and transfers the partly finished disc to the equipment’s chamber that applies alloyed metallic layers to the data side of the disc. Since this layer rests closely to the data pits, a protective UV coating is applied to shield the layer from the elements. Protection; the disc is covered with layers of protective films such as a protective UV coating. The coating also provides a place for the label to be printed. CD, DVD, and Blu-ray replication will differ as their general composition will show discrepancies. 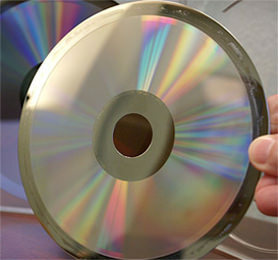 The laser beam will have a smaller diameter in creating data pits for DVDs as compared with CDs, and the laser is even thinner for Blu-ray. DVDs have two polycarbonate substrates bonded together with heat in comparison with CDs. For Blu-ray, using additional mastering server drives or a separate LBR may be required. Configurations of how the stampers are shaped will vary to compensate for the format being manufactured. Content authoring and encryption processes will also differ among types of discs.